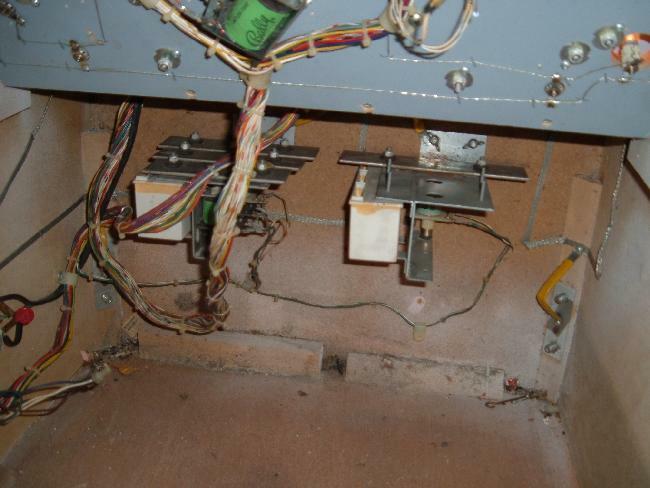 It had all the usual problems too, because this machine had been stored and unused since 1980, so battery corrosion had run amuck. Bead blasted the -17 MPU board to remove the corrosion, updated the EPROMs to use a single 2732 at U2, replaced all the MPU board chip sockets, installed a coin style battery. This got the MPU board working on the test bench. Next had to service the rectifier board, re-pinning a number of the connectors. Tested the lamp driver board on the test bench, and made sure that was all working. Re-soldered all the male header pins on the score display boards (cracked solder joints.) This is all standard stuff on these old Ballys, and this game needed it all done. 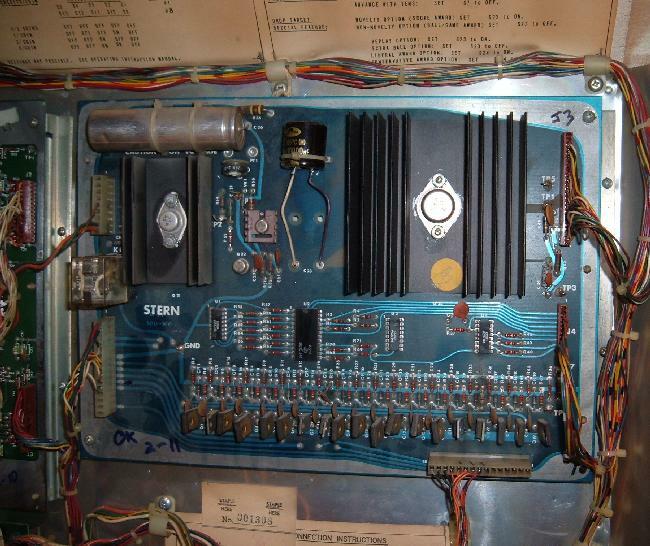 All that was left to service electronically was the solenoid driver board (SDB.) This was fairly messed up too – High Voltage power section needed to be rebuilt so the display voltage could be dialed down to 175 volts. Re-soldered all the male connector pins (cracked solder joints.) Tested all the TIP transistors and found a few that were shorted, so replaced them. Made some ground modifications and replaced the C23 filter capacitor. There everything was done, all the boards checked out on the test bench. The game should work right? Well hold one a second…. Powered the game up and none of the solenoids would energize! 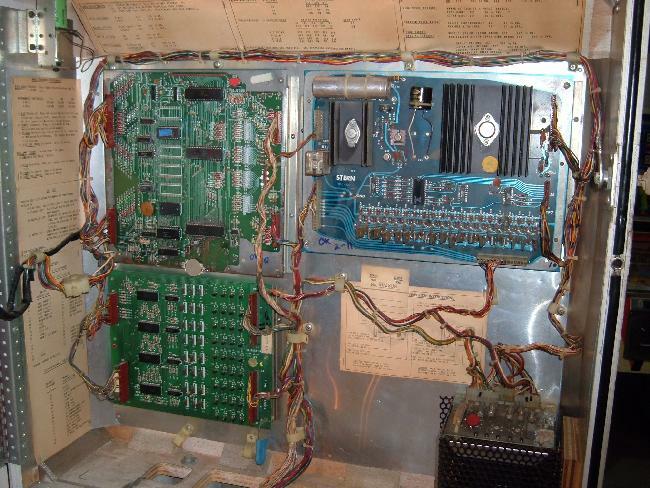 It wasn’t the 43 volt coil fuse either, because if that was blown the game wouldn’t boot, and it wasn’t the under playfield fuse. There was power at all the coils too. Grounded the transistor tabs on the SDB and the coils would manually fire, yet the game couldn’t fire any coils on its own. 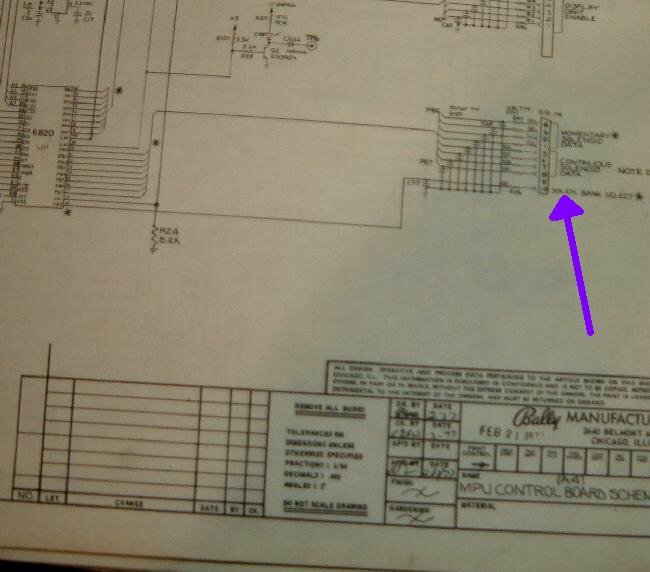 The problem was a connector pin on the MPU board at connector J4 pin 10. This is the solenoid select line, and the .100″ pin was broken. Without this line working, the game couldn’t select which coil to fire, hence no coils fired. Re-pinned that connector, and now the game could fire all the coils. Well almost all the coils. It turns out one of the chime coils did not work. This problem was that the coil was trying to fire, but the chime plunger was missing. Put a new chime plunger into the coil, and now all four chimes rang. The game needed some other work, like it was missing the center pop bumper mechanism. We had those parts around, so installed that. 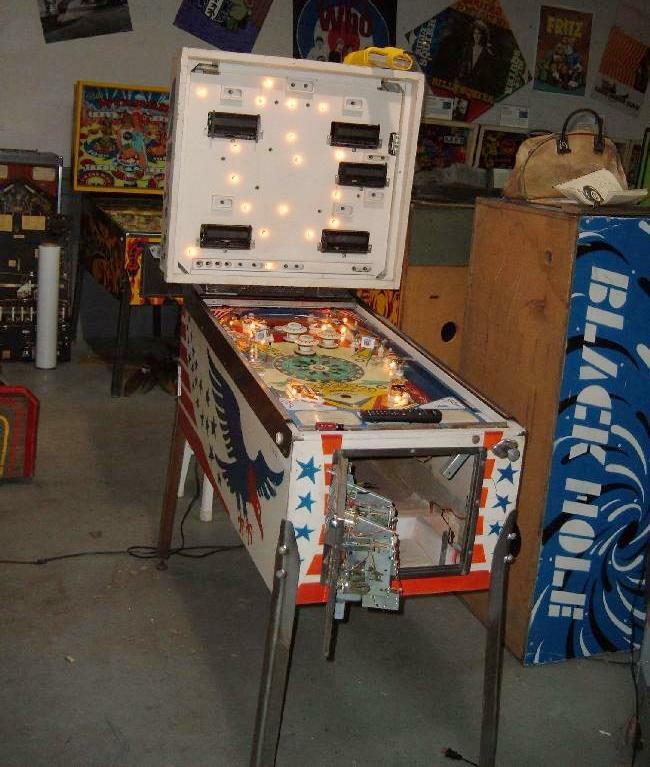 Also cleaned and re-rubbered the playfield, and did a quick flipper rebuild. Clearcoated the backglass and did some minor artwork touch ups with acrylic paint. The game was playing well, though it did require a lot of work, for a game that we ultimately gave away in a pinball tournament!